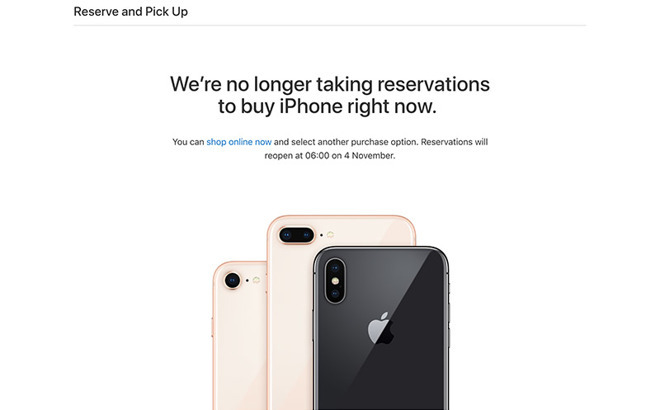 After a hugely successful preorder launch, Apple on Tuesday updated a handful of international websites to reflect new iPhone X Reserve and Pickup options set to begin on Nov. 4, giving customers another route to purchase. As part of Apple's ongoing efforts to distribute iPhone X units to eagerly awaiting customers, the company will on Saturday open its Reserve and Pickup retail system in a few countries. Dedicated informational websites that went live today show the option will be available to Australia, Belgium and U.K. customers starting at 6 a.m. on Nov. 4. Potential iPhone X buyers in Canada, Hong Kong, Switzerland and UAE will be able to place their reservation at 8 a.m. The walk-in reservation process allows customers to hold an iPhone X at a brick-and-mortar Apple store. Buyers complete a short form online, are furnished a unique registration code and have 30 minutes to visit the store they selected to complete the transaction. Apple told MacRumors it has no plans to activate Reserve and Pickup in the U.S., but noted the traditional pay ahead and pickup option is available. Apple traditionally opens walk-in product reservations shortly after a new device launches, and it seems the company is continuing that pattern with iPhone X. Last year, the option was offered to U.S. customers interested in purchasing an iPhone 7 one day after the device launched on Sept. 16. Whether Apple is setting aside iPhone X stock for Reserve and Pickup customers is unknown. The company last week said it would have limited supply on hand for Nov. 3, but urged customers to arrive early if they wanted to snag a copy. Online preorders for the device went live last Friday, with demand quickly outstripping supply. The selling out within ten minutes.